I was also surprised at how different the stories of the two films are. I expected the 1938 version to follow the plot of the earlier version. Not so! During the first half of Robin Hood, Douglas Fairbanks is still a nobleman and Prince John has yet to claim power over England. The meeting of Robin and Marian, the grudge with Guy of Gisbourne, and Robin's loss of his lands are all presented in a different manner. Even though I'm a big fan of Wallace Beery, I still like The Adventures of Robin Hood best. Robin Hood was a bit slow at times. It's great for a silent film, but it's more interesting for who's in it and its style than for the actual plot. The Adventures of Robin Hood (1938) is a great watch-it-with-the-kids movie for the holidays or for snow days; children who are excellent readers and have long attention spans and are interested in England, the Middle Ages or the 1920s would probably enjoy Robin Hood (1922), but I wouldn't count on it to entertain a large group. I love Errol Flynn and Olivia de Havilland! 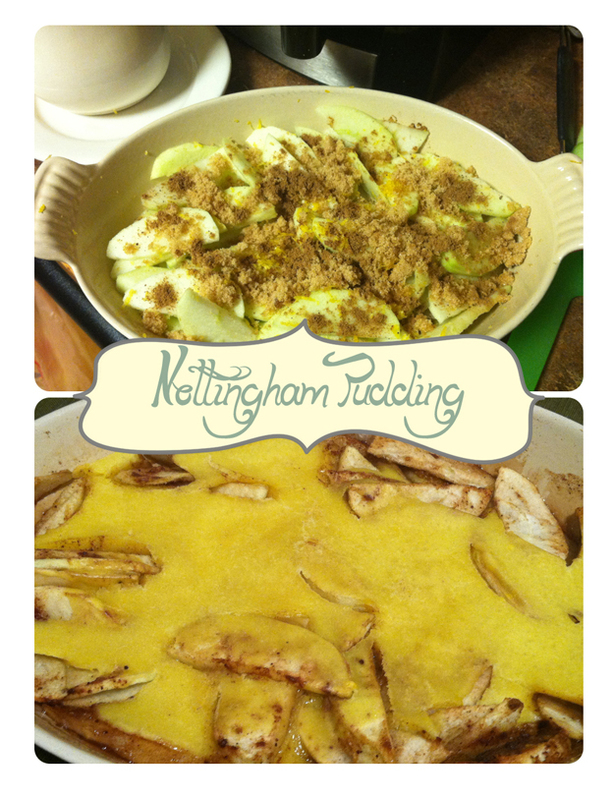 Since I obviously can't get enough of Nottingham...I made a Nottingham Pudding (just like I said I would!). It's basically spiced apples in Yorkshire pudding batter. Sift the flour into a mixing bowl, add a pinch of salt and whisk in the egg yolk. Add the milk and water and whisk like crazy until all the lumps are out of the batter. Set aside for 30 minutes. Peel, core and thinly slice the apples and place the slices in a casserole or au gratin dish. Grate the lemon zest over the apple slices then add the mixed spice, brown sugar and walnut oil. Stir to combine. Place the casserole in the middle of the oven and set oven to 400˚ Fahrenheit. When the oven comes up to temperature, take the casserole out, give the apple mixture a stir and pour the batter over the hot apple mixture. Return casserole to oven and bake 20 to 25 minutes, or until batter is golden brown and cooked through. Serve warm. Adapted from a recipe in the Coventry Telegraph. The Adventures of Robin Hood (1938) images from Doctor Macro. 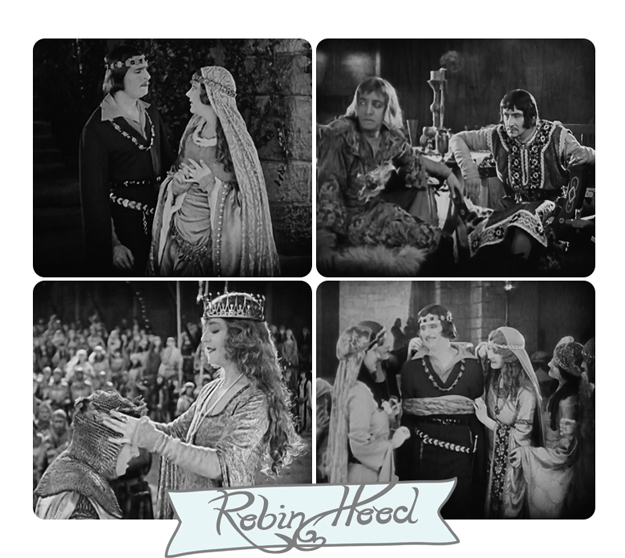 My screen caps from Robin Hood (1922). Both films are available on DVD. The Adventures of Robin Hood airs on TCM Sunday, February 5, at 11:45 a.m. CST. Horror of horrors. I chipped my front tooth late last night. It's the second time in my life this has happened. Only difference? Last time it was a baby tooth. It's a good thing I don't have a job to go to, because I am mortified. Plus, we just changed insurance and I don't have a dentist yet. Fingers crossed that I can get an appointment quickly! I just can't believe it. Update 12/6/11 8:37 a.m.- I just got an appointment for 11 a.m. today! I'm so relieved. Evidently, the dentist office had a few cancellations due to the snow. Every cloud has a silver lining? How lovely to read you're such a huge fan of Douglas Fairbanks, too, Lauren! Likewise! I always loved seeing him play either Robin Hood or a pirate, he was the best until Jack Sparrow came along, lol! Your recipe looks delicious, would love to have a go at this. Oh, and don't worry about the dentist, I've had my front tooth chipped, too, and it was mended quite easily ;-) Good luck! The Adventures of Robin Hood with Errol Flynn has always been one of my all time favorite films. Just love it. What a superb cast! I've never seen the silent version, but I do like Douglas Fairbanks - most especially as Sinbad the Sailor. I love a good pud, and this one looks and sounds perfect to hit the spot at any time of year. I have a soft spot for Errol Flynn too! I was glad I could get an appointment, too! All is well. I need to see Sinbad the Sailor. Robin Hood was my first Douglas Fairbanks movie. 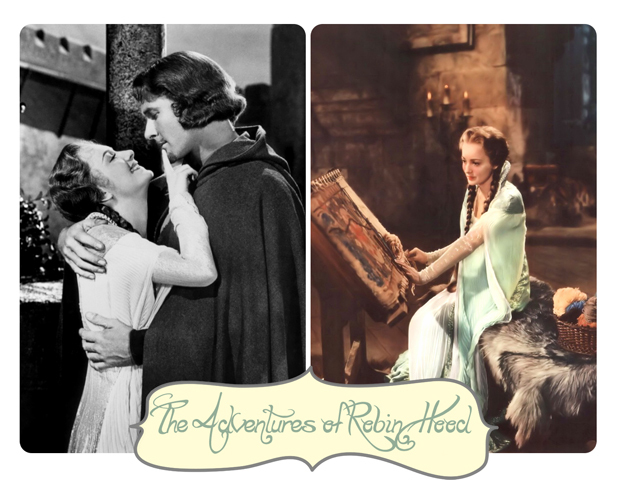 Enjoyed reading about the two Robin Hoods, as I've never seen the silent version. Your pudding looks delicious! I might have to step outside my box and see the silent one just for the experience. Your observations are instructive and interesting. So interesting that your comparing films. I just watched Mutiny on the Bounty with Marlon Brandon, would now like to compare it to the one with Mel Gibson. Nottinggham Pudding does sound interesting. I'm so feeling for you and your chipped front tooth. My nephew was running and chipped the bottom of his front two teeth, he had work to got to the next day, he was so mortified. He rang me and cried his heart out. I felt helpless. H'es got them seen to, but his eating sweetcorn off the cob are over. I am so glad you got to see a dentist, really. If you're new to silent films, I think my absolute favorite (so far) is Flesh and the Devil with John Gilbert and Greta Garbo. I had no idea there was even a version of Mutiny on the Bounty with Mel Gibson. I don't think I've seen the one with Marlon Brando (or the one with Clark Gable). I didn't even think about corn on the cob! I've been eating all of my food with my back teeth, because I'm supposed to be careful with the filling for a bit. It's very awkward! I'm glad to have it fixed, though. I love your pudding tribute to the Hood. I'm so sorry about your tooth and happy you got to see the dentist quickly. I hope it all went well. This is a lovely pudding! I can't resist apple desserts. I've never seen the silent movie before but it seems really interesting. I've watched all the versions of Robin Hood though and I still can't get enough. Thanks for also sharing the recipe, I can't wait to try it out.